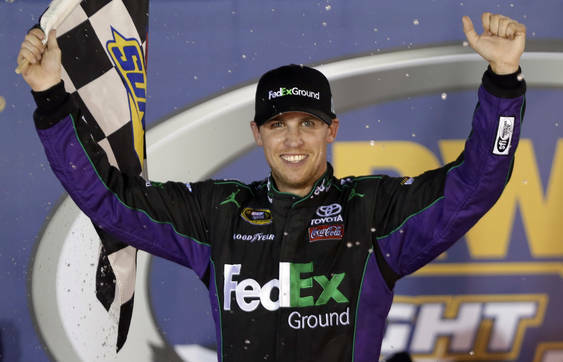 Denny Hamlin passed Carl Edwards for the lead on Lap 462 of 500 and never looked back, taking the checkered flag Saturday night at Bristol (Tenn.) Motor Speedway in the #11 FedEx Ground Toyota for his third victory of the 2012 season and 20th of his NASCAR Sprint Cup Series career. Hamlin pulled a ‘slide job’ to complete the winning pass, diving into Turn 3 at the famous high-banked half-mile circuit and up in front of Edwards at the exit of Turn 4. He pulled away and cruised to victory by a 1.103-second margin over runner-up Jimmie Johnson. It was an eventful night for the FedEx team. After starting eighth, Hamlin quickly moved up in the running order before his first pit stop of the night. While exiting his pit stall, Hamlin was hit on by Landon Cassill — who was entering his pit — causing damage to the car’s right side. Shortly after, while running fourth, Hamlin slid in oil laid down by David Ragan’s car and hit the outside wall, causing more damage to the #11 machine. Both times, however, it seemed to make the FedEx car even faster, as Hamlin was the only driver to get Bristol’s bottom groove to work. The decisive pass came after the final restart, when Hamlin took the green flag in fourth before passing Johnson, Brian Vickers and Edwards for the win. The victory marked the 200th for the #11 in Cup Series history, the winningest number all-time in NASCAR, and it moved Hamlin up to eighth in the current standings with two regular season races remaining, 75 points behind leader Greg Biffle. The Series returns to action on Sunday, September 2, at Atlanta Motor Speedway.